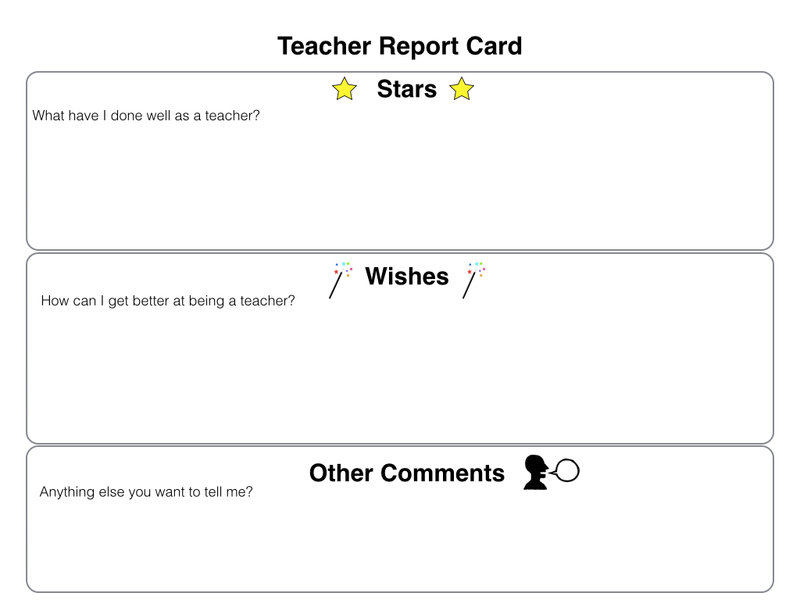 Report Cards for Teachers: Are we afraid to ask? Should teachers get report cards? A place to communicate what teachers have done well and what they can work on? A report card from their students! As teachers we spend tons of time working on report cards to communicate strengths, areas for growth and next steps for our students. But if we are truly learners first and teachers second, shouldn’t we want to hear what our strengths, areas for growth and next steps are as teachers? And who better to tell us, than our students themselves!? My first year in the classroom, I asked my students to write me report cards at the end of the year. Their feedback was so useful, that I was upset I couldn’t use their suggestions until the new school year! So my second year in the classroom, I had my students do a mid-way report card to let me know how I was doing and this time I was able to take their feedback and use it to become a better teacher for the remainder of the year. From there, I got into the habit of having my students write me a report card every time I wrote them a report card. The feedback alone was worth it. It helped me realize how my students saw me. It helped me understand what helped them learn. It helped me reflect on what I need to change and develop in order to serve them better. More than that, it created an amazing shared purpose. I was responsible for helping them to become better students and they were responsible for helping me to become a better teacher. We were all teachers and we were all learners. Some teachers might be apprehensive to give their students a chance to do this. Who better to help us grow professionally than the people we are trying to serve? Who better to know what our students need than.. our students? What better way can we create a community of learners than to invite students’ feedback to help us grow? What are we afraid of reading on those report cards? If we are nervous to see what feedback our students may have for us, then that might be a warning bell that we need to re-evaluate some of our classroom practices and approaches to teaching and learning. Let’s aim to be the type of teachers who can confidently and openly invite constructive feedback from our students. After all, they are the reason we do what we do. So let’s listen to what they have to say. Previous Article Are we stealing their thinking? I love the idea of students giving us feedback about our teaching! Thanks for the teacher report card idea. I am so using this! Provocations (such as the canteen pranks), making learning fun, field trips, genius hour, helping us when we don’t understand something, being kind and caring, not shouting at us. Giving more projects, and to give more free time. I then compiled all their comments together and we discussed how I can improve on my goal to give more projects. We talked about the project piece and I am now working on that part with them!